Click on the headings to go down to the next level of detail. 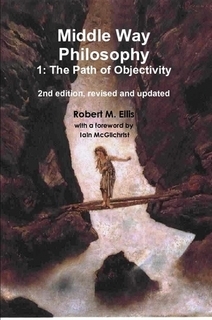 This book offers an account of objectivity: a quality at stake in many day-to-day judgements. It challenges an unhelpful model of objectivity as absolute. When it is absolute it can only be opposed to relativism. An incremental understanding of objectivity based in experience, however, avoids both absolutism and relativism. This incremental alternative needs to be synthetic and inter-disciplinary, and this account of it has been gradually built up from a variety of influences, beginning with a Ph.D. thesis. It is also probably best read in a synthetic way that tries to appreciate interlocking dependencies. This section first establishes why absolute or metaphysical claims cannot be justified due to sceptical argument, and why sceptical argument is irrefutable. The implications of sceptical argument, however, are provisionality and incrementality, not relativism or nihilism. Negative metaphysical claims are not implied by sceptical argument, and are clearly distinguished from agnostic positions, even though a variety of modern philosophical approaches slip into them. A priori and revelatory arguments for metaphysical ‘truth’ are refuted, along with the absolute assumptions often made about the fact-value distinction and the self. So far, then, I have been attempting to remove traditional metaphysical assumptions to clear the way for a philosophy built on experience. But what, more positively, does this mean? This section is largely concerned with working out a relationship between Middle Way Philosophy and other movements that have appealed to experience, such as empiricism, phenomenology, and science. Middle Way Philosophy is argued to be distinct from these past movements. It also sketches out approaches to meaning, justification and integration that will be expanded in more detail later on. Central to this presentation is the idea that experience is not just a fixed entity: not some kind of passive, neutral receptacle for what the world throws into it. Experience, rather, works at varying levels of adequacy which enable us to think of degrees of objective value as an inseparable part of experience. The Middle Way is the central concept of Middle Way Philosophy, based on an avoidance of absolutes in judgement. In this section it is differentiated from Buddhist accounts (although Buddhist inspiration is credited) and treated as a universal principle also applicable in the context of other traditions. Its nature is explained in relation to feedback loops, non-dualism, brain lateralisation, the good, integration, and dialectic. It is argued that the Middle Way is not deduced from a final good such as Enlightenment, but is independent of such beliefs, and that it is not itself a metaphysical belief, because of its interdependence with practice. This section offers an interpretation of ‘objectivity’ not as an absolute, but as an incremental and dispositional quality: in this respect following one widespread usage of the word. It is argued that factual, moral, compassionate, aesthetic, and adaptive forms of objectivity are not distinct from each other, but all depend on the degree of adequacy applied by a person at the moment of judgement. That adequacy is created by the practice of the Middle Way, in avoidance of absolutes that disrupt it. This section argues for an account of justification that does not involve downward deduction from absolute assumptions about ‘truth’ or ‘knowledge’, but rather combines coherence with provisionality (or recognition of the lack of absolute justification). Because the recognition of our limited perspective is itself a form of justification, we can incrementally justify our positions not just positively from the evidence, but also subtractively from our non-absolute treatment of that evidence. As argued, moral objectivity is a central aspect of Middle Way Philosophy. Given that objectivity is a characteristic of people’s judgements rather than states of affairs out there, values are not in any way inferior to facts in their capacity for objectivity. This recognition puts us in a position to create a new, more effective kind of ethics in which we avoid the confusion, dogmatism and false neutrality that bedevil contemporary moral debate. This section considers why we ‘ought’ to become more integrated and objective as an implication of widespread experiences of ‘oughtness’, It argues that we are responsible for our judgements to the extent of our integration, and that different forms of moral theory (consequentialist, deontological and virtue-based) are all stimuli to objectivity that should not be absolutized as total explanations of right action.